Welcome back! As plant-based living may be new for you – or perhaps you just need new ideas – I thought it would be helpful to give you a tour of my kitchen so that you can see the types of produce I buy and some of the nonperishables that I regularly keep on hand. 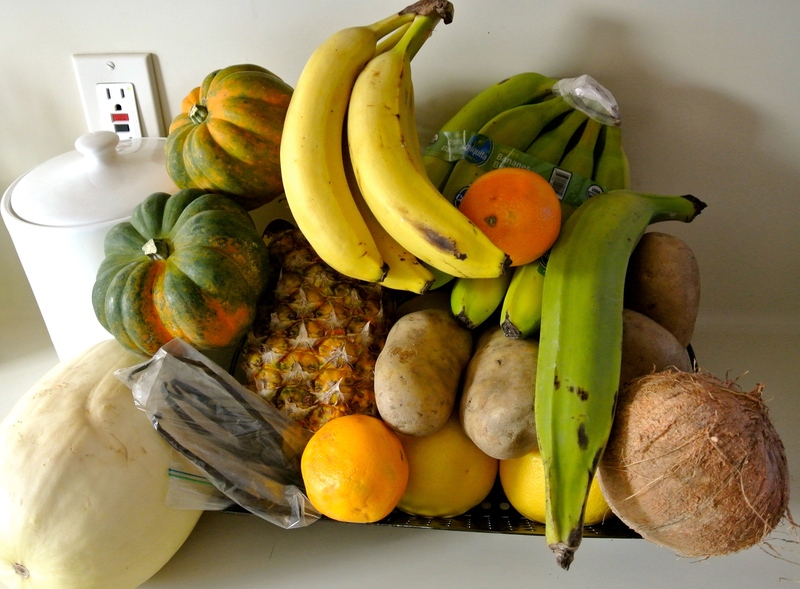 The photo that you see at the top of this post is a shot of my countertop, which is often overflowing with produce that does not require refrigeration. I maintain a plentiful stock of bananas, as I use them in many of my recipes and they are among my son, Nolan’s, favorite fruits for snacking. This time of year, I also have an array of citrus, much of which I obtain from neighbors for free. Citrus fruits are ripe for the picking during Arizona’s winter. Next, we move into my fridge, where you can spy everything from a batch of homemade veggie stock (located under Basic Formulas), to black-eyed peas that have been soaked and are ready for further cooking, a bowl of triple berry togurt (located under Breakfast Formulas), and of course, more produce. We always have a ton of it and get the biggest bang for our buck with a local food co-op called Bountiful Baskets. Through this organization, weekly, we have the opportunity to pay a flat rate of $25 to obtain approximately $50 worth of organic produce. The offerings are seasonal and often local and the contents of the basket are always a surprise. Check out the bountifulbaskets.org or conduct a web search to see if your state offers a similar program. On to my spice cabinet, which is my husband, Travis’s, pride and joy in our kitchen! Although the spices and herbs sometimes get misplaced during quick cooking, my hubby generally has them organized by ethnic application (e.g. Italian, Mexican, etc.) or other similarities. For example, mace is located on the exterior of the nutmeg shell; although different spices, they are part of the same fruit and often used together in cooking/baking, so they are grouped together. 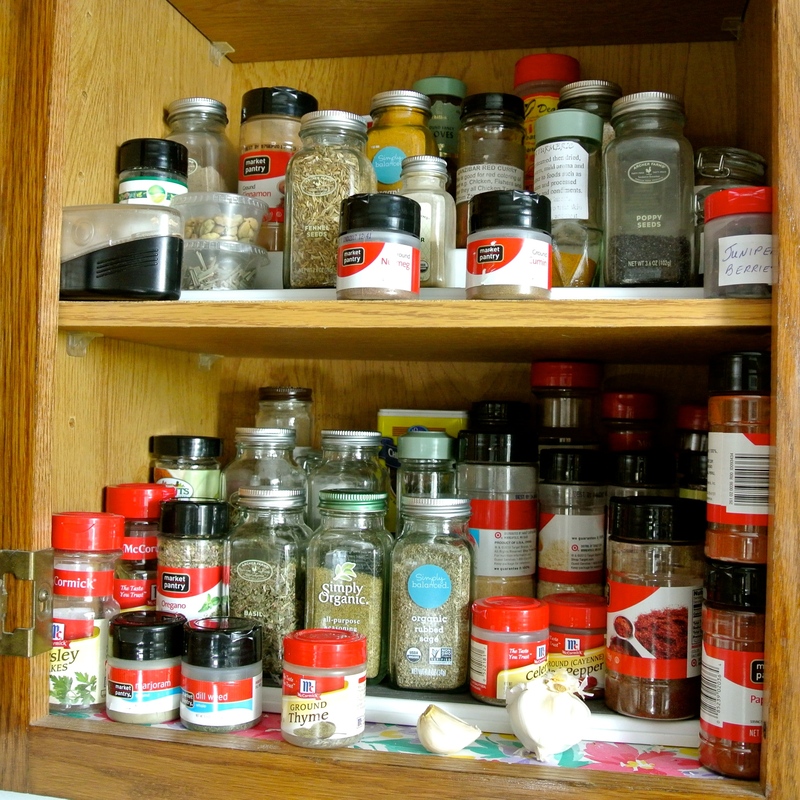 Yea, I know – our cabinet organization is a bit over-the-top, but with over 60 spices and herbs to choose from, it does well to have them arranged in a way that allows for easy selection. When we travel we stock up on herbs and spices that are native to the area and end up saving a ton, as those in jars in the supermarket can be pricey. We are still using, for instance, cinnamon sticks that we purchased during our honeymoon on the British Virgin Island, Tortola, in July of 2011, and turmeric that we bought the following summer when touring a spice farm in Zanzibar, an island off of the coast of Tanzania in East Africa. Finally, here’s a look into my pantry. First, you can see a variety of oils, vinegars, and sweeteners. It is amazing what these products can do in the way of flavor, even in very small amounts. On the two shelves below those you’ll find staples like beans (dried and canned, no sodium added), seeds, and grains. While I always have quinoa and oats, for example, regardless of price, more expensive items like nuts, dried fruits, and dark chocolate I purchase and stock up on when they are on sale. The flexibility of my formulas and my willingness to experiment with new combinations allow me to create a delicious bite out of whatever I obtain. The very top shelf (not pictured) includes standard baking supplies like cornstarch and baking powder. If your kitchen needs a plant-based makeover, consider starting with one or two target areas and make changes slowly, especially if you’re trying to get a meat-and-potatoes spouse or some picky little ones on board. When Travis and I decided to start eating more healthily, the first item we did away with was cow’s milk, which we replaced with almond. Travis, who was a diehard whole milk drinker for years, now swears by almond and I, being lactose intolerant, couldn’t have found a better milk match. Nolan is even more adventurous, drinking coconut and oat milks on a regular basis. If those do not appeal to you, you could try soy, flax, rice, grain, cashew, sunflower, etc. There are lots of options that don’t include added sugar, hormones, or cholesterol and are often higher in calcium than the dairy variety. Plus, you can easily make your own plant milk (we’ll cover that another day, too)! I hope that a private tour of my humble cooking headquarters has given you some ideas and inspiration so that you are prepared to tackle my formulas (and plant-based living in general) head on. Happy shopping and stocking! ← Welcome to The Fresh Formula! So much storage. I miss that! I feel like the walls are closing in on me all the time, so I don’t know how you do it in Japan! You’ve got a great system!